Welcome to Week Commencing 19th June 2017! We have a trio of Weekly Deals which run Monday to Sunday each week. 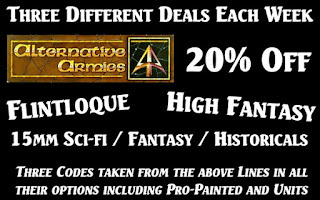 Each week three different offers all at 20% off normal price for a code within the range on all of its options including painted and ready for play as well as whole units if applicable. We have a Flintloque code deal, a High Fantasy code deal and a 15mm scale code deal. Get something for your wargaming and check them out every Monday when they change.